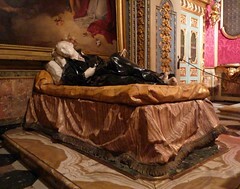 Pierre Le Gros the Younger, Stanislas Kostka on His Deathbed, 1703, upstairs at Bernini’s Sant’Andrea al Quirinale. Frank Dabell appears in this video courtesy of Context Travel. Cite this page as: Frank Dabell, Dr. Beth Harris and Dr. Steven Zucker, "Pierre Le Gros the Younger, Stanislas Kostka on His Deathbed," in Smarthistory, November 18, 2015, accessed April 20, 2019, https://smarthistory.org/pierre-le-gros-stanislas-kostka/.